Updated Wednesday August 3, 2016 by Benoit Douillette. 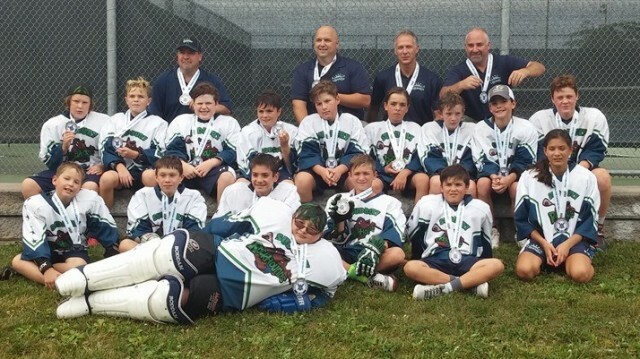 The Sudbury Peewee Rockhounds entered the OLA (Ontario Lacrosse Association) Division “C” Provincials ranked somewhere in the middle of the pack. They emerged from the weekend much better than that. Coach Dave Lachance and company strung together five straight wins at the ideal time, weaving their way through to the championship final before being edged 5-4 by the Cornwall Celtics and settling for second place. Fine-tuning their game at practice last week, the squad was busy working both ends of the floor. Offensively, plays needed to be crisp. To a man/boy, the Rockhounds were fixated on improvement. “I think we’ve learned to move around in the house, not stand still and wait for a pass,” said Mason Lachance, who was making his fifth or sixth trip to the OLA Festival. “We’re trying to play our positions as best as we can,” Lachance continued. “Defensively, whenever we cheated, it always came back to bite us.” In spite of a lineup that ranks below the average in size, the Peewee Rockhounds found a way to overcome. “We need to pass, and we need to catch our passes,” explained Côté. “And play good defense. We can’t be scattering, we need to play the box. We have to be sure to slide to keep the box.” In the end, the locals would dodge a few bullets en route to their silver medals. The Rockhounds opened round robin play with a 7-6 win over the Burlington Chiefs, and made it back to back victories on Friday with a 7-4 triumph over the Nepean Knights. First place in Group 2 would come courtesy of an 8-6 win over the Huntsville Hawks, with the Sudbury lads advancing to the final four after bouncing the Milton Mavericks 9-2. Still no slowing down on Sunday morning, as the northern squad slipped past the Centre Wellington Mohawks, before finally falling just one goal short in the final. The 2016 Peewee Rockhounds team included Kiaus Lalonde, Oliver Côté, Stephen Rathwell, Jack Gouchie, Easton Hinschberger, Alex Hachez, Brandon Salem, Ashton Eadie, Alexie Dokis-Dupuis, Mason Lachance, Bradford Scarpellini, Brek Morrow, Brandon Roney, Andrew Whitehouse, Cameron Shanks and Ben Harris.